For the last four weekends, we in Cambridgeshire have enjoyed the ‘Open Studio’ programme which kindly allows people such as myself (an art lover) to enter into artists’ studios and look at their work and even watch them at work. One of the stops I made was at the studio of a favourite artist of mine by name of Anthony Day. 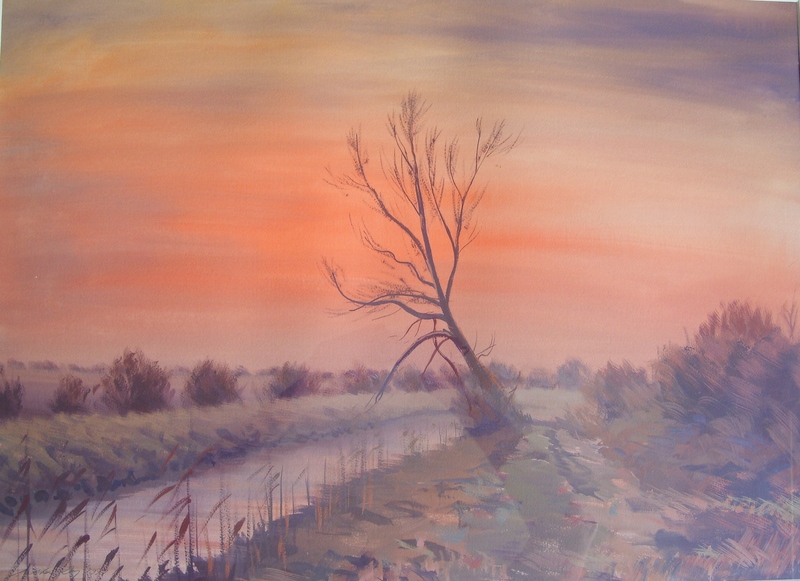 A well known fenland painter who uses subtle colouring to capture the fenland skies, fields and waters. His inspiration is found in the land which surrounds him. Walking to most of the scenes which he paints. Local does really mean local. His love and respect for his subject, the fenland, is honestly portrayed in his paintings. Bringing to life the warmth, the expanse, the depth and at times wildness of the fens. Monk’s Lode runs between Cambridge and Ely. Walk or cycle this path and you too can experience the sights, sounds and odours which inspire Mr Day’s paintings. Feel the fens first hand; their lushness, their starkness, the life they enfold, the vast landscapes, expansive skies, and vivid colours of life and decay. This is a part of the country which many consider ‘too flat’ to be lovely but just one look at Mr Day’s paintings proves that the Fens, even though flat, have a beauty, a depth, an honesty which can be felt. They seem to say “I am what I am. Accept me for what I am. Love and respect me for what I am. I am no more no less”. ‘Sunset at Monk’s Lode’ hangs prominently in my living room and is a continuing reminder that this is the beauty in which I live. This entry was posted in Watercolour paintings and tagged canal, embankment, lode, path, shrubs, sky, tree. Bookmark the permalink.